McKee's 37 Leather Shampoo 70/30 128 oz. Home > Shop By Brand > McKee's 37 Waxes, Compounds, Coatings > McKee's 37 Leather Shampoo 70/30 128 oz. Clean & condition in one step! McKee's 37 Leather Shampoo 70/30 is a unique blend of leather care – 70% cleaner and 30% conditioner! The pH-balanced, water-based formula is free of silicone oils and petroleum solvents and makes McKee's 37 Leather Shampoo 70/30 safe and highly effective on coated, aniline, semi-aniline, and King Ranch leather. McKee's 37 Leather Shampoo 70/30 is a rich formula infused with lanolin and mink-oil to feed your leather as it cleans! Leather is delicate, there's no way around it. The slightest abrasive material across the surface can create microscopic scratches, while even your jeans can stain the delicate finish. You need to care for your leather the same way you care for your paint – with the highest quality products available. McKee's 37 Leather Shampoo 70/30 is a gentle cleaner that will both clean and condition your leather surfaces. McKee's 37 Leather Shampoo 70/30 is pH-balanced and includes lanolin and mink-oil. These natural ingredients keep your leather supple and conditioned and prevent against cracking and fading with age. A noticeable absence in the McKee's 37 Leather Shampoo 70/30 is the inclusion of silicone oils or petroleum solvents, which are known to dry and age your leather prematurely. In fact, McKee's 37 Leather Shampoo 70/30 is so gentle that it's completely safe to use on King Ranch leather – one of the most delicate types of leather out there! For more soiled leather, a soft horsehair or boar's hair brush can be used to gently scrub away the surface grime. 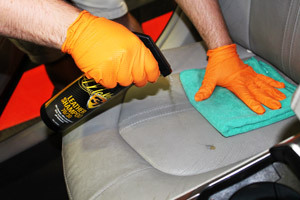 If your leather isn't so bad, a microfiber towel will be enough to clean the surface. When in use, McKee's 37 Leather Shampoo 70/30 creates a thick and foamy lather that helps to protect against scratching in dark leather during the cleaning process. It's recommended that only a soft, horsehair brush is used on leather, and McKee's 37 Leather Shampoo 70/30 works incredibly well with that material – even on the delicate leather stitching! Do not use McKee's 37 Leather Shampoo 70/30 to clean leather that is hot to the touch. Spray McKee's 37 70/30 Leather Shampoo directly onto the surface and gently agitate using a soft bristled brush (horsehair is recommended). Do not use a nylon bristled brush. Work McKee's 37 Leather Shampoo 70/30 into the surface until a rich, foamy lather is produced. Wipe away lather using a soft and clean microfiber towel. McKee's 37 Leather Conditioner 128 oz.